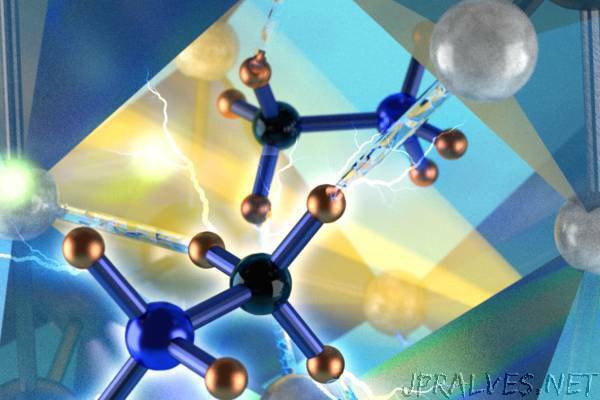 “Neutron scattering has revealed, in real time, the fundamental mechanisms behind the conversion of sunlight into energy in hybrid perovskite materials. A better understanding of this behavior will enable manufacturers to design solar cells with increased efficiency. The multi-institutional team of researchers from the Department of Energy’s Oak Ridge National Laboratory, Hunan University and the University of Nebraska–Lincoln used photoluminescence measurements, along with neutron and x-ray scattering, to study the relationship between the material’s microscopic structure and its optoelectronic properties. By examining the material under varying degrees of temperature, the researchers were able to track atomic structural changes and establish how hydrogen bonding plays a key role in the material’s performance. Their results are published in the journal Advanced Materials. Hybrid perovskites hold promise to be more efficient in converting light into energy than traditional solar cell materials. They are also easier to manufacture as they can be spin cast from solution and do not require high-vacuum chambers for synthesis. Unlike their singular silicon or germanium counterparts, hybrid perovskites are made of both organic and inorganic molecules. The structure is built from inorganic lead and bromine molecules arranged in octahedral units that form cages around the organic methylammonium cations (positively charged ions) consisting of carbon, nitrogen and hydrogen. Finding the right combination and molecular orientation of the organic/inorganic components is the key to unlocking more functionality, but understanding those interactions requires the right tools. Using the TOPAZ instrument at ORNL’s Spallation Neutron Source, the team was able to observe the hydrogen bonding interactions at the atomic scale. The experiment revealed the material undergoes significant structural changes between approximately 150 and 130 Kelvin (roughly -190 and -225 degrees Fahrenheit). Cooling the material slowed the movement of the organic component into an ordered state, in which precise in situ measurements were made in real time to observe exactly how the organic molecules were binding to the lead-bromine component through hydrogen bonds. Complementary photoluminescence and x-ray scattering measurements, along with crystal synthesis, were conducted at CNMS. Theoretical calculations were performed by scientists in ORNL’s Materials Science and Technology Division. Xiao and Wang’s coauthors include lead author Bin Yang, Wenmei Ming, Mao-Hua Du, Jong K. Keum, Alexander A. Puretzky, Christopher M. Rouleau, Jonsong Huang and David B. Geohegan.